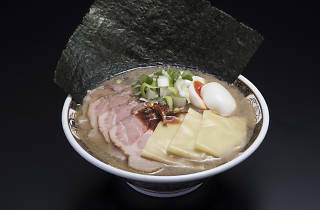 The Nagi ramen chain now has half a dozen shops scattered around Tokyo, but in 2008 it returned to its birthplace by reopening a branch in Golden Gai, Shinjuku’s famed old-school bar district. Located on the second floor of an old wooden house, this Nagi comes steeped in the atmosphere of the neighbourhood, with a smell that hits you as soon as you walk in the door. And no wonder – the speciality here is pungent niboshi ramen, made by boiling vast amounts of dried sardines for 12 hours to create a distinctive, boldly flavoured soup. 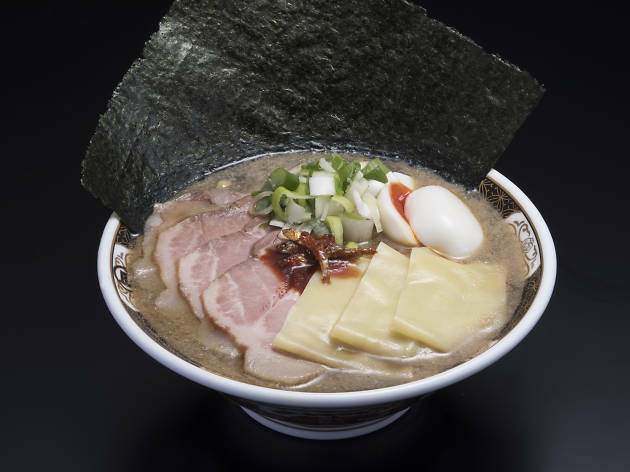 We recommend the tokusei niboshi ramen (¥900), which comes generously laden with slices of chashu pork, menma (seasoned bamboo shoots), scallions, nori seaweed and a soft-boiled egg, and with a mix of curly and wide, flat noodles. If you fancy something a little different, the tsukemen (¥870) and shio (salt) ramen offer alternative ways of enjoying that potent niboshi taste. As an added bonus, Nagi is open for business 24 hours a day, meaning you can start and end a heavy night out with a bowl of their noodles.